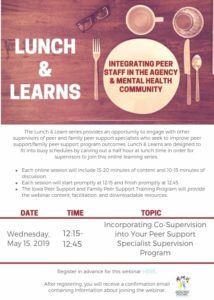 Information about upcoming peer support specialist and family peer support specialist trainings, as well as continuing education opportunities for both professions. Continue to develop your skills! Below are educational opportunities for FPSS, PSS, and supervisors in Iowa. Take advantage of them to increase your marketability, improve your skills, and have a pulse on the mental health landscape in Iowa. Many of these educational opportunities could qualify for CEUs. Please visit the Iowa Board of Certification website for more information. The following trainings are approved by the Iowa Board of Certification (IBC) for 90 minutes of ethics training which can be applied toward the initial application for PRS certification or for Continuing Education Units for both PRS and FPSS. Continuing Education Units for both PRS and FPSS. initial application for PRS certification or for Continuing Education Units for both PRS and FPSS. 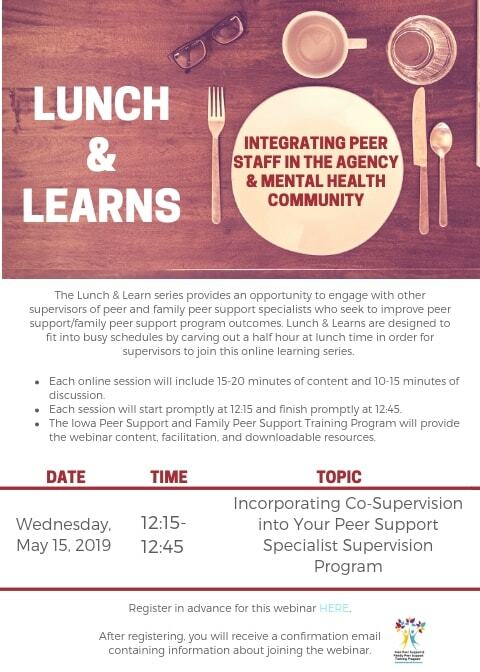 Trainings listed below are offered by online distance learning companies and meet the CEU requirements for Peer and Family Peer Support Specialists. There are fees required to complete the trainings. Once complete, these trainings may be submitted to the Iowa Board of Certification as Distance Learning. An IBC processing fee of $15 may apply. Please contact the Iowa Board of Certification for more information.